There are a few important factors to selecting training pants for your youth-sized child; usage, material, style and size. Simply determine when you will use these training pants, which material and style you prefer, and which size you need. Usage: some youth briefs are designed specifically for night use while others are designed for daytime use. 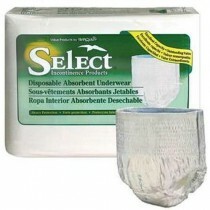 Youth potty training underwear for night use, such as the Comfees DriNite's will better protect against spillage that could occur during sleeping than a daytime training pant. Material: youth training pants are made from different materials. Toddler training pants, such as the wonderpants, are designed with underwear-like material and the purpose of that is to help facilitate potty training. If the youth experiences skin irritation from a traditional training pant, try a hypoallergenic youth brief, such as the Cutie Pants. Style: the main difference in style is whether the diaper has refastenable sides or is pull-up style. When the child is active, a pull-up style brief may be ideal, but if the child is non-mobile refastenable sides would make changes easier. Many pull-up style briefs have tear away sides but are not necessarily refastenable. The Curity and Pull-Ups briefs have tear-away sides. The Cutie Pants and Tena Youth Briefs both have refastenable sides. Size: potty training pants are designed for toddlers who are potty training and for older youths, so it is important to find the correct size. For potty training toddlers, sized 2T-5T, a few brands to try are Cutie Pants and Huggies. For older youths, with waists sized 17-29 inches, try the Tena Youth Brief and at night try the Curity Sleep Pants for youths 45-125 lbs. Potty Training Underwear are designed for children with thinner legs and smaller waists than traditional baby diapers. Accounting for these differences between babies and children helps to prevent leaks, provides more absorbency and offers more comfort due to a better fit. Variations in the toddler training underwear account for differing body types between growing children. Training underwear have additional utility in environments away form home such as school. Vitality Medical offers a range of sizes to meet your child's specific needs.